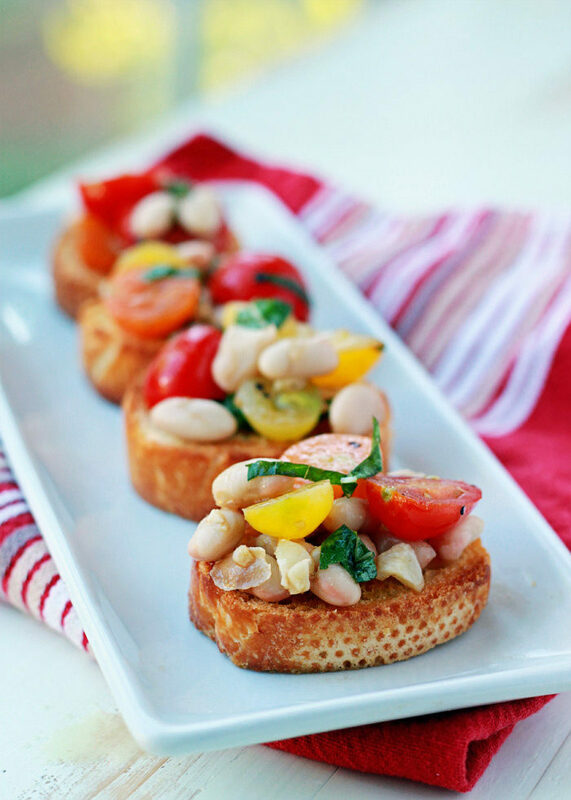 Fresh tomatoes and creamy white beans tossed with basil, balsamic, and loads of garlic, then loaded onto crunchy golden toasts. Does it get any better than this?! 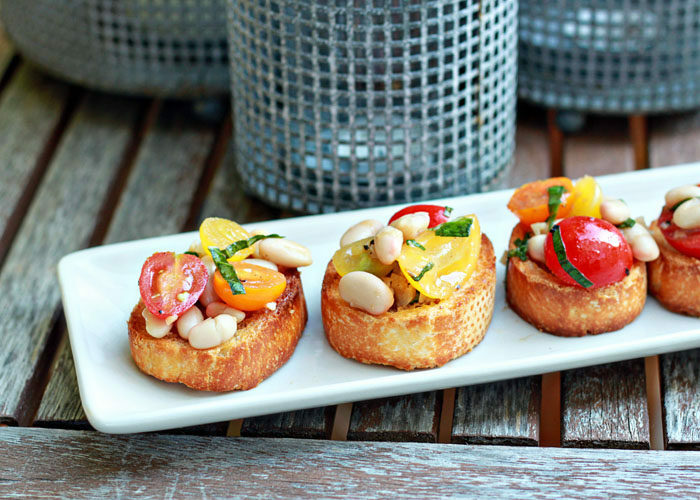 One thing I’m willing to bet we all know and can agree on is that bruschetta – the kind with the garlicky tomato salad topper that we generally find in the U.S. – is freakin’ out-of-this-world delicious. Addictingly can’t-stop delicious. A good bruschetta, I think, is all about the tomatoes. Juicy, garden fresh cherry tomatoes are my weapon of choice – just cut them in half and you’re there. For the tomato salad topping, I started with this base recipe from the not-Italian (that I know of) but always tasty Pioneer Woman. 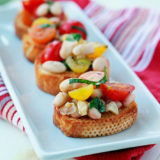 For this version, Cherry Tomato and White Bean Bruschetta, I add a good helping of – you guessed it – white beans. I love how they add heft, a creamy bite, and, of course, satiating protein. 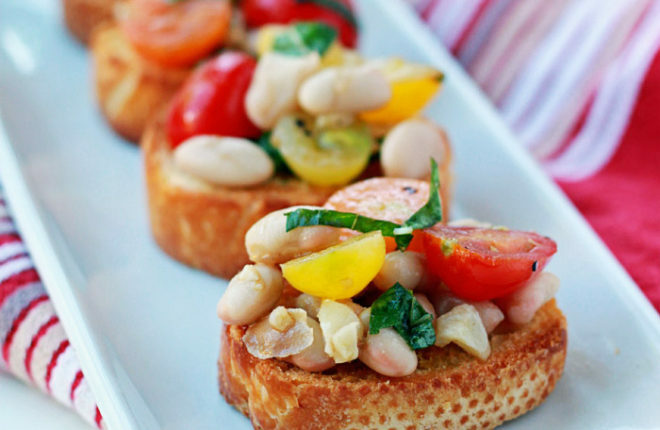 Basically, what I think is that the addition of beans means you can have bruschetta for dinner. Other happy ingredients include lots of garlic, good olive oil, balsamic vinegar, and fresh green strips of basil. Tom-ay-toe, to-mah-toe, broo-shetta, broo-sketta. No matter how you say it, this is good stuff right here. Make the toasts. Preheat oven to 425 degrees Fahrenheit. Brush a large cookie sheet with 1 tablespoon of olive oil and lay the bread on the sheet. Brush the tops of each slice with the remaining 2 to 3 tablespoons olive oil. Bake until golden brown around the edges, 5-8 minutes. Remove from oven and let cool slightly. Rub each piece on both sides with cut sides of 2 or 3 cloves garlic. Set aside. 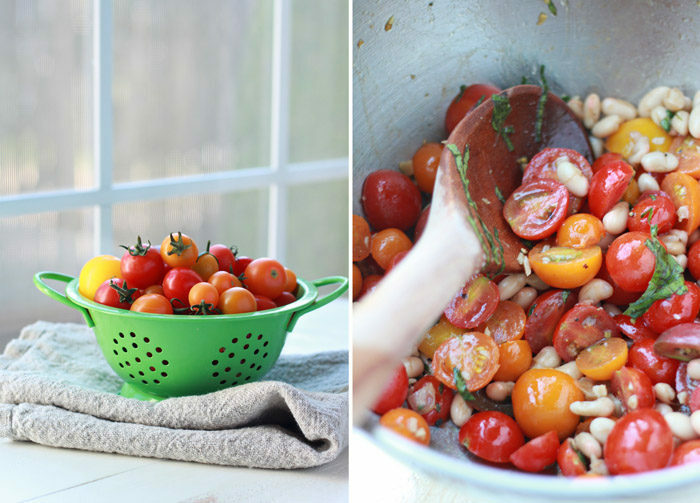 Make the cherry tomato and white bean salad. Set a small saute pan over medium heat. When hot, add 2 tablespoons olive oil and the 6 cloves minced garlic. Saute, stirring frequently, for about 1 minute - just until the garlic is soft and beginning to turn golden (but not dark brown - that's burned!) Transfer the garlic and oil to a small bowl to cool. Add the cherry tomatoes, beans, balsamic vinegar, basil leaves, and 1/8 teaspoon each salt and pepper to a medium bowl. Pour in the sauteed garlic, oil and all. Mix well. Taste and add additional salt and pepper if desired. I like lots of extra pepper! The tomato salad keeps well refrigerated (in an airtight container) for up to 24 hours. It can keep for longer, but the tomatoes start to get a little mushy, which personally I don't love. The toasts keep well in an airtight container or bag at room temperature for up to 24 hours (or can be frozen for several weeks).